Summary: It is Thursday at Microsoft TechEd 2012 in Orlando, and Microsoft Scripting Guy, Ed Wilson, lets you in on all the happenings. Microsoft Scripting Guy, Ed Wilson, is here. Today is the last day of Microsoft TechEd 2012 in Orlando, Florida. The morning began with the Scripting Wife’s invitation to breakfast with the very first meeting of the PowerShell Chicks Virtual User group. Their slogan is “Chicks were born in shells.” In their first meeting, they all told stories about how from their disparate backgrounds, they got into Windows PowerShell and how it has changed the way they work. They plan monthly virtual meetings. The initial members live all over the country, and they are planning online meetings. 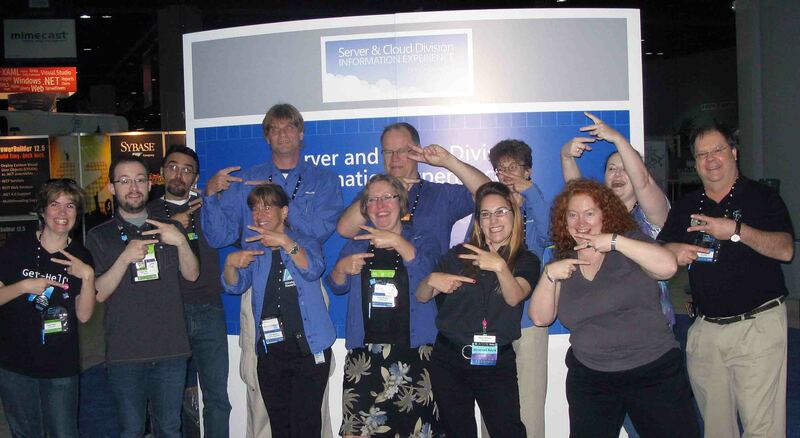 If you would like to become involved with PowerShell Chicks, contact JuneB@microsoft.com. Their Twitter hashtag is #PowerShellChicks. You are also welcome to follow @JuneB_Get_Help because she will tweet meeting information. Here June B. and Gaby K. discuss new features in Server Manager. One thing that is really cool, is that with June hanging around the Scripting Guys booth, she got to meet the two winners of the 2012 Scripting Games. As a matter of a fact, she asked them each to write a Help_About* topic for the official Windows PowerShell documentation! WOOHOO! How cool is that? Well, following the PowerShell Chicks breakfast, everyone gathered around the Scripting Guys and the Server & Cloud Division Information Experience booth for a group photo. Here the away team gets their PowerShell on. Following our group picture, Microsoft MVP, Sean Kearney (aka BatchMan) showed up at the booth. He was looking for evil productivity-sucking tasks to eliminate with simple Windows PowerShell one liners. Today is going to be a really busy day at the Scripting Guys booth. The booth area opens at 10:30 AM, and we will be joined by Microsoft PFE, Matthew Reynolds, in addition to Microsoft MVP, Clint Huffman. At noon, Mark Minasi will be joining us to sign autographs and to answer questions. Then I have my second Birds-of-a-Feather session. This time, I am cohosting with Microsoft MVP, Jeffery Hicks. If you are at TechEd, we will be in room S-319. Yesterday’s session was sold out, with people standing in the hallway to listen in. So you will want to try to get there early to get a good seat. Finally, TechEd 2012 concludes today with the conference party. The Scripting Wife and I will both be there, so make sure you come and hang out. It will be awesome.